The theme for this weeks FLOWERS is - 'Vases, Bottles and Containers'. A few years ago I used to sell vintage on eBay - a big part of what I sold was exactly what our theme is about this week - vases, bottles and other containers. I had a lot of fun and my little business was very successful - but after a few years I ran out of steam - there are a lot of very early 5 am starts going on buying trips to antique-markets and car-boot sales in the UK and loppis in Sweden - a fair amount of driving and it's also very competitive - everybody wants the best bits. My point of telling you this is to say that I still have a lot of vases, bottles and containers - that I just couldn't part with! 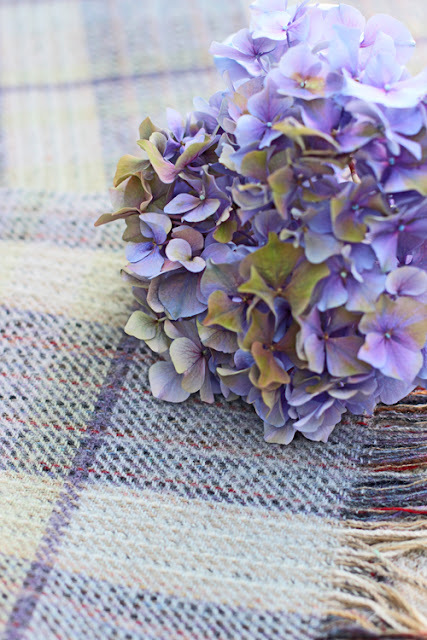 I love how the colours in this Hydrangea matches the colours in the blanket. Perfect autumn colours and don't you just want to wrap yourself up in the blanket and sit in front of the fire? 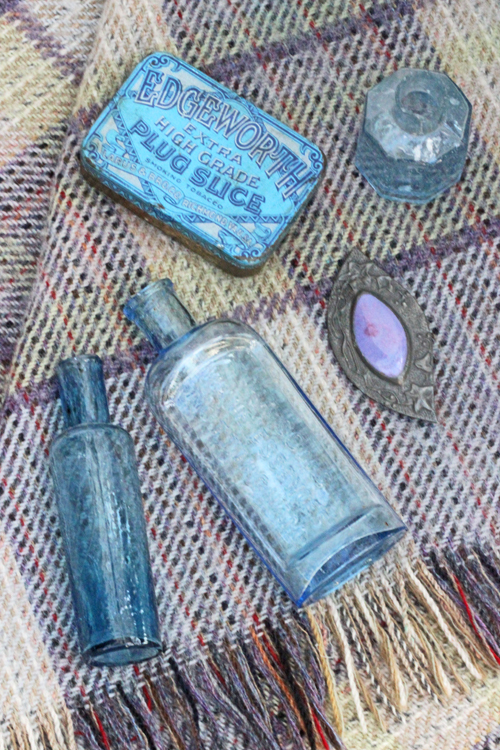 I have a bit of a weakness for blue bottles and my little collection often sits in a window where they reflect light into the room. The large vase with ridges is new and I bought it in Sweden last summer. I was with my friend and she bought the same vase. 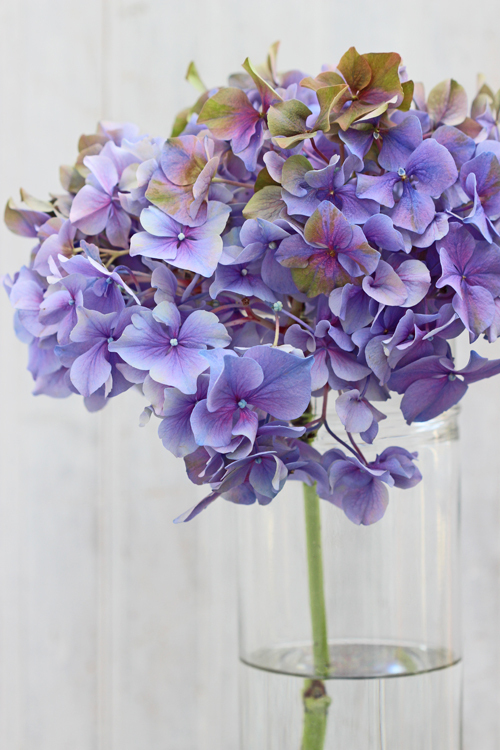 We both love it as it holds the flowers very well - the neck is wide enough to hold a handful of large stems perfectly. The large clear glass container with straight sides in the background is one of my favourites. My daughter bought it for me when she went to an antique market earlier this year. 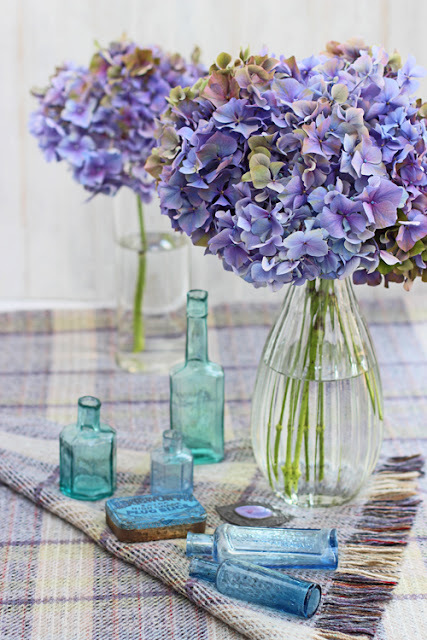 The smaller vases are a mix of ink bottles and apothecary bottles in beautiful blue and turquoise-blue colours. All great for holding just one small stem - cut very short. I have always enjoyed visiting antique markets or charity stores and I still find interesting types of containers that I will use as vases - for very little money. If you intend to start your own little collection of vases and containers - flea-markets, car-boot sales, loppis and charity stores are a good beginning. Many small vases or bottles with single stems - arranged on a tray looks beautiful. With larger containers you can either fill them with lots of stems or have just one stem leaning to one side. 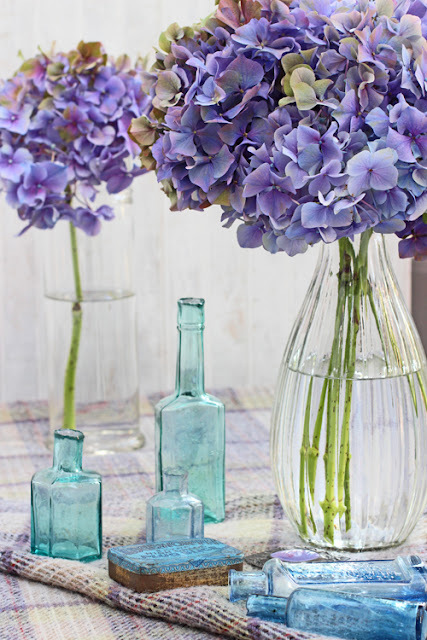 There are so many different ways to use vases, bottles and containers. Why not go to your nearest charity store and pick up a few in different sizes and start experimenting making your own arrangements. Please, go over to Titti's blog and have a look at how she has interpreted the theme this week. 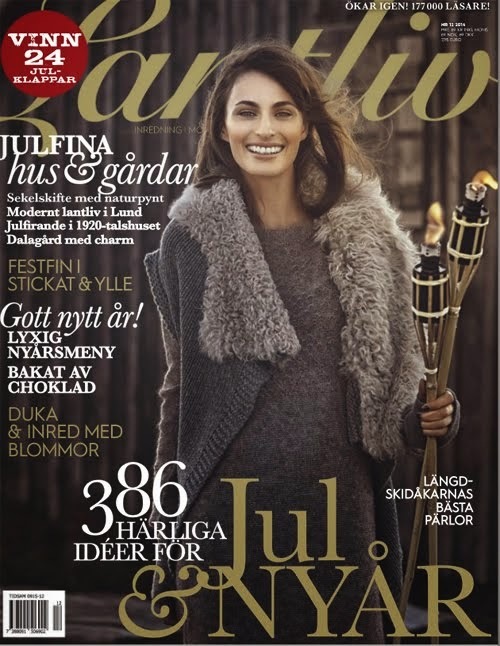 Here is a link to her blog HWIT BLOGG. I will be back on Sunday with another Florets - floral quotes by a flower lovers. Åhh så fint Ingrid! Jag älskar också blå flaskor men äger inte en enda! Nu får jag börja leta lite för vackert är det...ett härligt och inspirerande inlägg i sköna toner! Ingrid, the colors in these photographs will inspire me to some knitting colorways. I just know it. It was interesting to read about you ebay experiences. 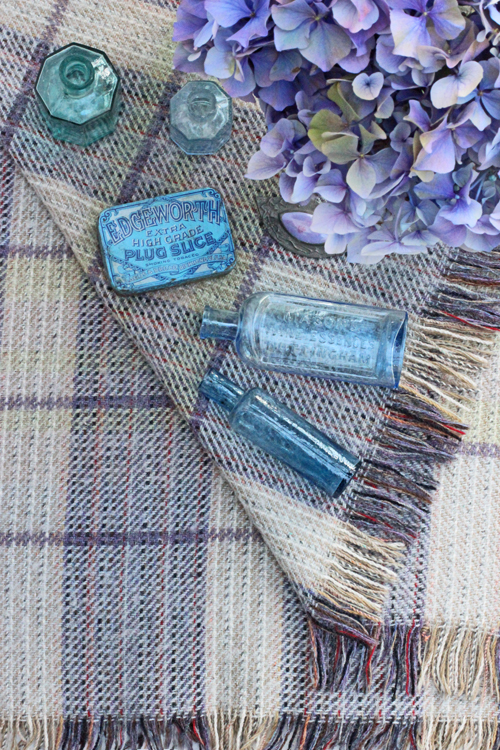 You certainly do have a wonderful eye for both vintage and contemporary glass and chinaware. Oh metal containers, too.